When we think of new bathrooms, our minds wander into the "spa-like retreat" category that fills us with the sort of calm and quiet comfort we'd like to enjoy at home. 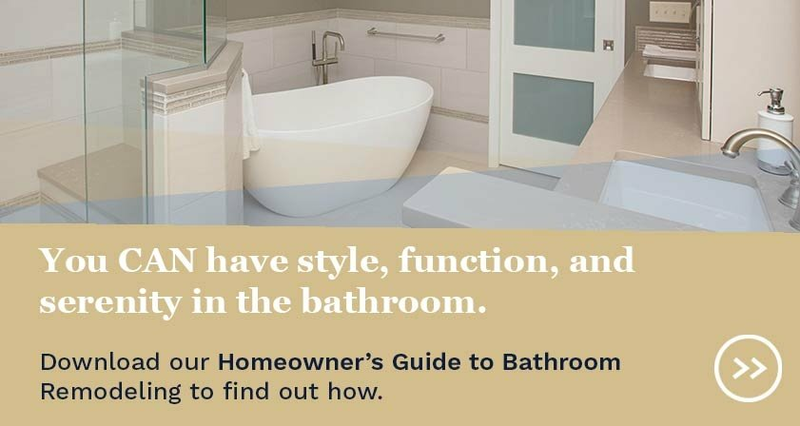 While it's possible to create a bathroom that feels like an oasis from the world, there is also a need to account for how you'll use the bathroom in your regular, daily life. 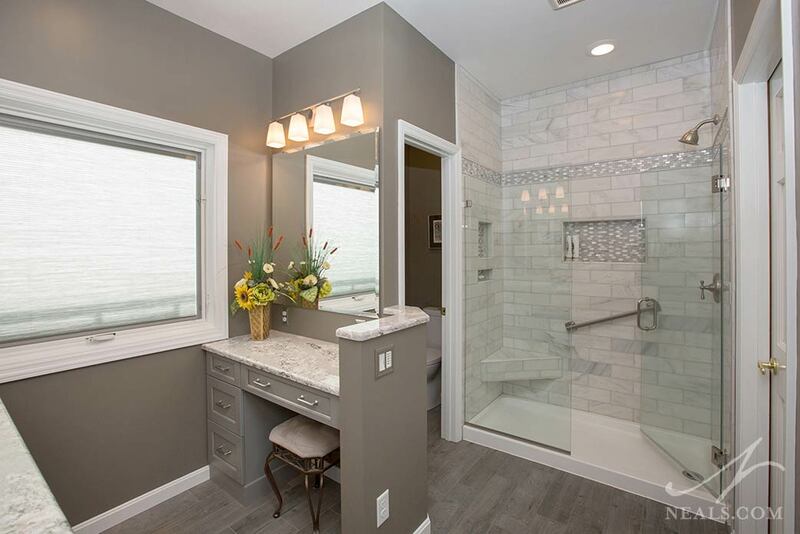 Soaking tubs and steam showers aside, here are 6 practical bath design ideas. 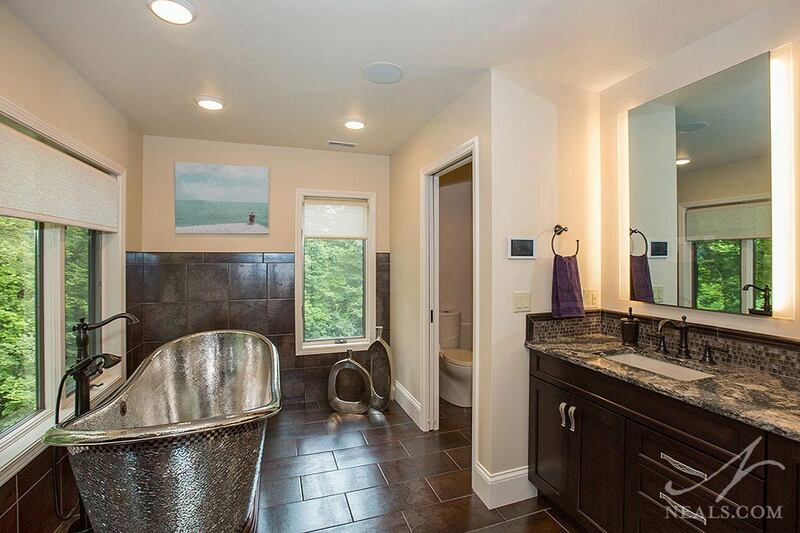 This shower in Pierce Township includes a corner bench and two convenient niches. You can have the fanciest shower in the world, with state-of-the-art sprays and gorgeous tile work, but if you don't have a place to put your soap, that pretty shower will be hard to live with pretty quickly. Installing tiled wall niches in your shower, sized correctly for the types of products you use, is a minor consideration compared to the convenience they offer. Benches or ledges are also great additions to a shower, adding a place to sit or a spot to prop your leg up for shaving. A storage cabinet across from the shower in this Maineville bathroom holds two clothes hampers. Nothing kills the polished look of a remodeled bath like a clothes basket inconveniently stashed wherever there's space on the floor. If you require a hamper in your bathroom, it's a great idea to account for that when planning your cabinet or linen closet design. 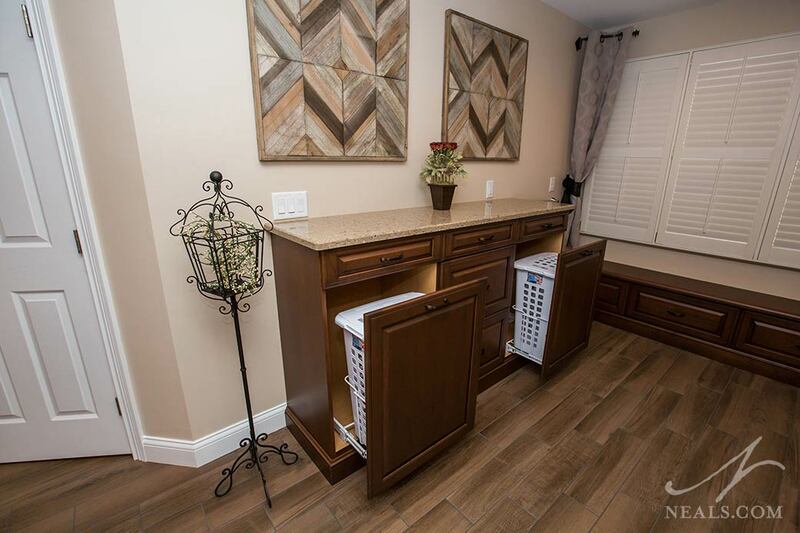 A pullout cabinet for a basket or two is a common option offered by cabinetry manufacturers. 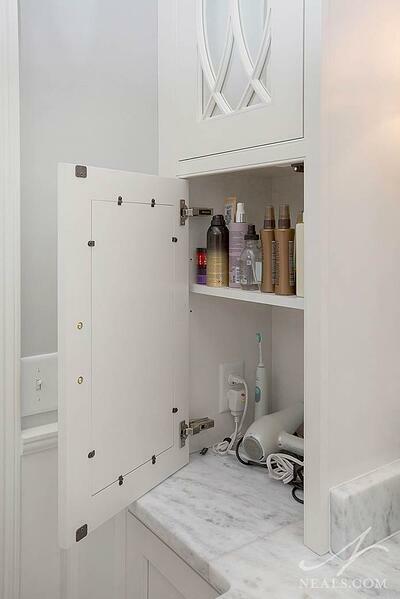 A cabinet on this Indian Hill bathroom vanity provides an outlet and space for daily personal care tools. Whether your bathroom tasks are minimal or complex, all bathrooms need convenient places for the things we use daily to be stored. Otherwise, everything ends up on the vanity counter, and that's as far away from a calming spa as you can get. There should be places for the simple items like toothpaste and hair brushes, but also consider what you have in the way of makeup or tools. If you have curling or flat irons, consider using a drawer or cabinet specially designed to keep them charged and ready. A pocket door makes it easy for the commode to be closed off in this Indian Hill master bathroom. 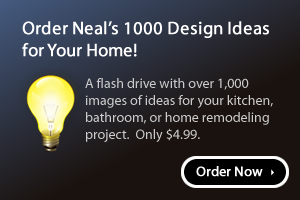 The commode is the elephant in any bathroom remodel. It's important, therefore, to consider the location of the toilet with two key thoughts. What will be the most convenient location for my daily needs? What location will provide me with the right level of privacy for my comfort? In some bathrooms, a separate water closet or commode room makes the best sense, particularly for a shared bath. In other cases, a half wall, or a nook will do the trick. The important thing is to not overlook this element of your bathroom. 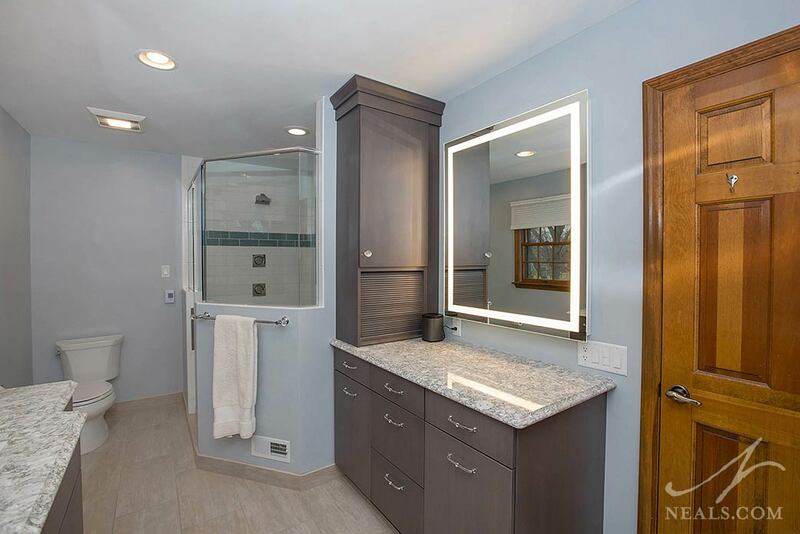 An additional mirror in this Fairfield bathroom remodel has integrated task lighting. Some tasks can't be done well if you don't have the right amount of light to see what you're doing, and shaving may be the best example. While vanity lighting can be beautiful and help carry your bathroom's style, when you go to put a razor to your chin, you'll want to know you're seeing things clearly. Consider integrated mirror lighting, which creates a soft glow around your entire face without feeling like you're under a heat lamp. Hooks on the shower half wall keep towels at the ready in this Anderson Township bathroom. We've all been to that one house. You know, the one where you have to put the towel for when you finish your shower on the toilet or vanity because the only towel hook is on the back of the door. Towel bars or hooks should be placed so that you have to go the least amount possible from the shower, tub or sink to reach it. 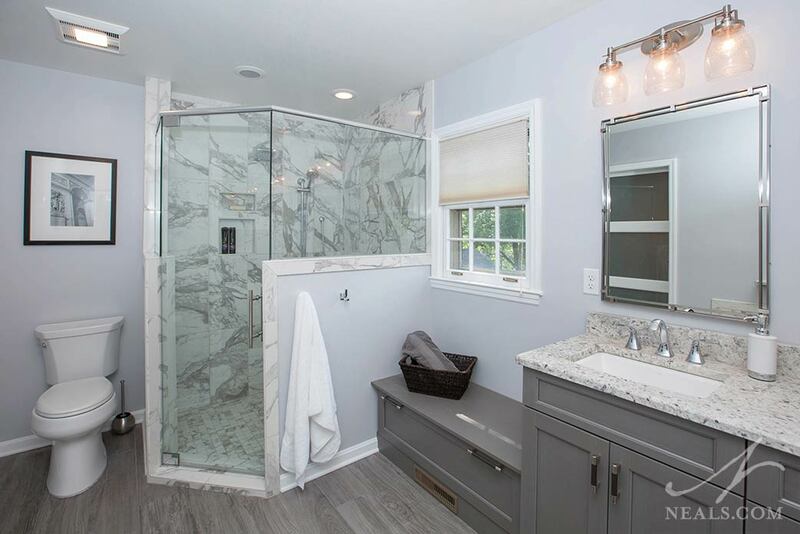 Not all bathrooms make this easy in due to the shape or available walls space they offer, so you may need to think about utilizing shower half walls, the sides of cabinets, or even inside the shower itself.